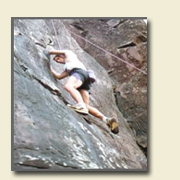 Royal Wheels India is an adventure travel group organising Camping in India. Air: Nearest airport - Jolly grant, 175 kms. Rail: Nearest railway station - Hardwar, 170 kms. There are 5 - double tents. 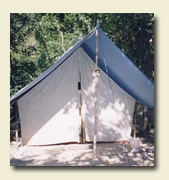 The tents are furnished with twin beds, two cane chairs and a writing table. Since there is no electricity, lanterns are provided for the late evenings. There is a common dining area where all meals / tea / snacks are served. It is our priority to maintain high levels of hygiene. The food is mainly cooked from grains and vegetables grown at camp or in nearby villages. The main menu has some Garhwali delicacies. The water in the dining area is filtered. The washroom and toilets are not attached to the tents. For ecological reasons they are set up above the high water mark. They are a permanent construction furnished with flush toilets. There are showers in the bath and hot water is provided in buckets. Fly fishing/ angling – A two minute walk to the ‘Assi Ganga’, the river is good for brown trout, in addition to various local species of fish. Assigana has its origin from the Dodital lake where the trout was first introduced by the Garhwal Maharaja. Bird-watching – The height of this region (approximately 4000 feet) makes it a rich habitat for a amazing variety of birds. The bird life around the camp is active and varied, from barbets to forktails to khaleej peasants to red starts, you'll find enough to sustain your interest. Wildflowers – On the meadows and in the forests, one can find wildflowers of breathtaking colour and beauty. Yoga/ meditation – Nestled in the lap of the Himalayas, amidst high spiritual energy fields; this is the chosen area for various ‘ashrams’. Trekking/hiking – The entire area is dotted meadows, hills, forests, villages – untouched and unaffected by the modern world. Kuflon is also on the route of the ‘Dodital’ trek. One could even follow the ‘gaddi’ trail of the nomads and go trekking up to altitudes of 10,000 to 14,000 feet. Day 01 : Arrive at camp for lunch, camp briefing, check in tents. A familiarization walk (1 hrs.) after tea. Campfire, followed with dinner. Overnight at Camp. Day 02 : Begin your day with an early morning bird watching hike (2-3 hrs). Thewalk sticks to a the road along the Assiganga stream. The best place for sightings of dippers, white capped redstarts or score a few lifers catching an occasional hungry Himalayan kingfisher. Return to camp for a home cooked buffet breakfast. At noon packed lunch by a totally secluded water pool. Tea at camp is followed with a small excursion to the village of Kuflon. Campfire, followed with dinner. Overnight at camp. Day 03 : An early morning visit to the trout breeding farm / Forest department managed herbarium. Return to camp for breakfast and departure.